The disciples gaze in astonishment upon the glorious scene before them as Jesus is transfigured. T HAD BEEN a long, hard climb up the rough slope of the great mountain near Caesarea Philippi, and Simon Peter, James, and John were very tired when at last they found a resting-place far above the quiet valley. These fishermen had not been accustomed to mountain-climbing, and no doubt they would have chosen to row a boat all day rather than to take such a weary journey. But Jesus, their master, had asked them to go with him to a place of prayer, and because they loved him they had followed. But now that they had come with him all the way up the mountain, they felt too tired to pray. So they fell asleep. And Jesus prayed alone. While the three disciples were sleeping, a great change came over their master. His face began to shine as the brightness of the sun; his clothing, too, gleamed as white as snow. And two men from heaven came to talk with him. They were: Moses, the man who had spent forty days alone with God on Mount Sinai when he was leading the Israelites from Egypt to Canaan; and Elijah, the prophet who had heard God's voice on Mount Horeb, where he had gone to escape the wrath of a wicked queen. Moses had written the law of God which the Jews had a part of their Bible; and Elijah was one of the prophets through whom God had spoken to his people in other days. While these two heavenly visitors talked with Jesus, the disciples awoke from their sleep. How surprised they were to see their master clothed in such brightness and talking with Moses and Elijah! They gazed in astonishment upon the glorious scene before them. Then as Moses and Elijah began to disappear from their sight Simon Peter exclaimed, "Lord, it is good for us to be here! If you are willing, let us build three tabernacles--one for you, one for Moses, and one for Elijah." 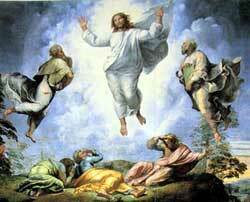 But while Peter spoke, a bright cloud descended upon the disciples, and they felt afraid. Then a voice spoke from the bright cloud and said, "This is my beloved Son, in whom I am well pleased; hear him." When the disciples heard the voice they fell to the ground, trembling with fright. After the voice spoke, the cloud lifted, and Jesus came and touched the disciples, saying, "Rise up, and do not be afraid." When they lifted their eyes they saw Jesus only; for the bright cloud had vanished, and the heavenly visitors, too, had disappeared. Now they believed that surely Jesus is the Son of God. On the next day when they came down from the mountain Jesus told them to keep this wonderful scene for a secret among themselves until after he should rise from the dead. The disciples wondered why he should be talking about pain, and grief, and death when he the Son of God had been visited with such heavenly glory. But they were careful to tell no one about what had happened when they were alone with Jesus on the mountain. Now the disciples asked, "Why do our teachers say that Elijah just first come before the Messiah appears?" Jesus answered, "Elijah has come already, but they have not known him, and they have treated him shamefully. So also will they treat me" And the disciples knew that he was speaking of John the Baptist, whom Herod had caused to be killed in person.